Cute truck. My Dad kept bees in the garden when I was a kid, so they always make me smile. I have removed you from http://Transplanted.collected.info but I hope you'll check it out (and the blogs that feed it) every now and then. For the record, it is for blogging Brits (and a select few others) so we would have been happy to include your feed, regardless of what your passport says - it's the transplanted bit that counts. Of course, as you'd prefer not, then that is fine. (Still looking forward to the story of how Fifty got her name, by the way). You put so many beautiful pictures on your blog! Thanks for dropping by and nice comment. It's nice to be here reading your entries. I like your blog. i am following you now. I hope you like mine as well.. 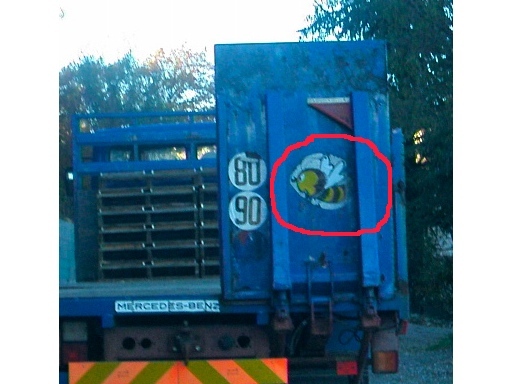 When I lived in France a "honey" truck was something else altogether! SarahF - cool! Did he make honey too? She Means Well - Fifty is named after rapper Fifty Cent. My husband named him. I didn't have anything to do with it! CATwife - we're all very well here, especially since the sun has come back! James - HA HA!! Naughty! Yeah, James stepped on my comment: the "honey wagon" back in the old days was, er, something quite else. By the way I think Fifty's name is cool. Great not Greta...greta sounds germanic. So cute! I never realized you called them the "honeys" because they literally have bees. So cute! Somehow I missed the fact that the Honeys "grow" bees, but I love the truck! That is one majorly stylin' ride right there. You should go with them one day, just sayin'. I'm glad that bee is nice and big, so passersby know not to get too close. Ahhh. So the Honeys really make Honey? The redhead - ha ha! excellent point! Such a happy picture! I love it! Cute! I love seeing all the things you share, that you just don't see around here!